Warranty: 3-year parts, 3-year labor, 3-year onsite support with next business day response. Does your data center need a secure, performance driven dense server that you can confidently deploy for virtualization, database, or high-performance computing? The powerful 2P HPE ProLiant DL360 Gen10 is redefining dense compute by delivering security, agility and unmatched expandability businesses want all packed in a dense 1U rack design. The HPE ProLiant DL360 Gen10 Server supports the Intel® Xeon® Processor Scalable Family with up to 28 cores, plus 2666 MT/s HPE DDR4 SmartMemory supporting up to 3.0 TB max. With the added performance that 12 NVDIMMs and 10 NVMe brings, the HPE ProLiant DL360 Gen10 means business. Deploy this dense platform for diverse workloads in space constrained environments and maintain it with ease by automating the most essential server lifecycle management tasks with HPE OneView and HPE iLO 5. NOTE: Other options not shown. NOTE: New! Rear drive option allows for an additional + 1 SFF or +1 Dual uFF (2x M.2 cartridges). NOTE: System Insight Display (SID) module will include #5-9 above (will not include #10 - iLO Service Port). NOTE: System Insight Display (SID) module will include #4-8 above (will not include #9 - iLO Service Port). NOTE: *This option will lose #7 iLO Service Port. NOTE: New! Rear drive option allows for additional + 1 SFF or +1 Dual uFF (2x M.2 cartridges), will lose one FH PCIe slot. Fans will be shipped for 1 or 2 processors. NOTE: *Only available on 8 SFF. NOTE: *For 10 NVMe chassis – Secondary Riser is not available due to 10 x4 NVMe riser for PCIe direct attached. NOTE: Will lose one FH x16 PCIe slot1 with this option. NOTE: Supports Various NICs up to 25GbE. NOTE: New Rear drive option available on all DL360 Gen10 chassis types for additional boot/storage: +1SFF or 1 Dual uFF (2x M.2 cartridges). NOTE: Optional High Performance Fan Kit available (includes 7 fans). NOTE: The DL360 Gen10 will support up to 7 fans with fan redundancy built in. One fan rotor failure will place server in degraded mode but fully functional. Two fan rotor failures could provide warning and imminent server shutdown. Processors – Up to 2 of the following depending on model. NOTE: For more information regarding Intel Xeon processors, please see the following http://www.intel.com/xeon. - 2 and 4 socket capable, 2S - 2UPI, 4S - 3UPI, 8S - 3UPI @ 10.4 GT/s. - 6-Channel DDR4 @ 2666 MT/s. - 768 GB max memory capacity (1.5 TB on select skus). - Intel Turbo Boost Technology, Intel Hyper-Threading Technology Intel AVX-512 (2x 512-bit FMA). - 48 lanes PCIe 3.0, advanced RAS. - 2 and 4 socket capable, 2S - 2UPI, 4S - 3UPI @ 10.4 GT/s. - 6-Channel DDR4 @ 2400 MT/s (SKU 5122 - supports 2666 MT/s). - Intel Turbo Boost Technology, Intel Hyper-Threading Technology, Intel AVX-512 (1x 512-bit FMA) (SKU 5122 - supports 2x 512 bit FMA). - 2 socket capable, 2S - 2UPI @ 9.6 GT/s. - 6-Channel DDR4 @ 2400 MT/s, 768 GB max memory capacity. - Intel Turbo Boost Technology, Intel Hyper-Threading Technology, Intel AVX-512 (1x 512-bit FMA). - 48 lanes PCIe 3.0, standard RAS. - 6-Channel DDR4 @ 2133 MT/s, 768 GB max memory capacity. - Intel AVX-512 (1x 512-bit FMA). NOTE: For more information regarding Intel® chipsets, please see the following URL: http://www.intel.com/products/server/chipsets/. NOTE: Read and learn more in the iLO QuickSpecs. NOTE: *128 GB LRDIMM and NVDIMM will be available 2H2017. NOTE: Maximum memory per socket is dependent on processor selection. Processors supporting 1.5 TB per CPU is indicated by the “M” in the processor model names (i.e. 8160M). NOTE: Mixing of RDIMM and LRDIMM memory is not supported. NOTE: For more information see our Memory RAS feature technical whitepaper. NOTE: If secondary full height kit is installed, then primary PCIe Slot #2 cannot be used. Only 2 full height slots are supported. NOTE: HPE Smart Array S100i SR Gen10 SW RAID will operate in UEFI mode only. For legacy support an additional controller will be needed, and for CTO orders please also select the Legacy mode settings part, 758959-B22. NOTE: HPE Smart Array S100i SR Gen10 SW RAID is off by default and must be enabled. NOTE: The S100i is a 14-port SATA controller, but only 12 ports are accessible as 2 are leveraged to support the 2 M.2 options on the Primary Riser. NOTE: If GPGPU is needed then please order the LH controller (low profile heatsink) to allow GPU to fit in the chassis. NOTE: For additional details, please see HPE Smart Array Gen10 Controllers Data Sheet. NOTE: Available in 94% efficiency. NOTE: Available in 94% and 96% efficiency. NOTE: Also available in -48VDC and 227VAC/380VDC power inputs. HPE Flexible Slot (Flex Slot) Power Supplies share a common electrical and physical design that allows for hot plug, tool-less installation into HPE ProLiant Gen10 Performance Servers. Flex Slot power supplies are certified for high-efficiency operation and offer multiple power output options, allowing users to "right-size" a power supply for specific server configurations. This flexibility helps to reduce power waste, lower overall energy costs, and avoid "trapped" power capacity in the data center. All pre-configured servers ship with a standard 6-foot IEC C-13/C-14 jumper cord (A0K02A). This jumper cord is also included with each standard AC power supply option kit. If a different power cord is required, please check the ProLiant Power Cables web page. To review the power requirements for your selected system, please use the HPE Power Advisor Tool. For information on power specifications and technical content visit HPE Server power supplies. NOTE: Both ports are not active simultaneously. NOTE: The MicroSD slot is not hot-pluggable, please power down server before removal. NOTE: Will lose iLO Service Port if selecting this option. NOTE: ClearOS allows you to build a fully functional server that is just right for you at no upfront cost. For more information on ClearOS, please visit http://www.hpe.com/servers/clearos. NOTE: For more information on Hewlett Packard Enterprise Certified and Supported ProLiant Servers for OS and Virtualization Software and latest listing of software drivers available for your server. NOTE: For additional technical thermal details regarding ambient temperatures, humidity and features support please visit: http://www.hpe.com/servers/ashrae. Unified Extensible Firmware Interface (UEFI) is an industry standard that provides better manageability and more secured configuration than the legacy ROM while interacting with your server at boot time. HPE ProLiant Gen10 servers have a UEFI Class 2 implementation and support both UEFI Mode (default) and Legacy BIOS Mode. NOTE: The UEFI System Utilities tool is analogous to the HPE ROM-Based Setup Utility (RBSU) of legacy BIOS. For more information, please visit http://www.hpe.com/servers/uefi. · Platform Trust Technology (PTT) can be enabled. · iSCSI Software Initiator Support. · HTTP/HTTPs Boot support as a PXE alternative. NOTE: UEFI FIO Setting (758959-B22) can be selected to configure the system in Legacy mode in the factory for your HPE ProLiant Gen10 Server. Monitor your servers for ongoing management, service alerting, reporting and remote management with HPE iLO. Learn more at http://www.hpe.com/info/ilo. Configure and boot your servers securely with industry standard Unified Extensible Firmware Interface (UEFI). Learn more at http://www.hpe.com/servers/uefi. Hassle free server and OS provisioning for one or more servers with Intelligent Provisioning. Learn more at http://www.hpe.com/servers/intelligentprovisioning. iLO RESTful API is Redfish API conformance and offers simplified server management automation such as configuration and maintenance tasks based on modern industry standards.Learn more at http://www.hpe.com/info/restfulapi. The HPE Active Health System (AHS) is an essential component of the iLO management portfolio that provides continuous, proactive health monitoring of HPE servers. Learn more at http://www.hpe.com/servers/ahs. Use the Active Health System Viewer, a web-based portal, to easily read AHS logs and speed problem resolution with HPE self-repair recommendations, to learn more visit: http://www.hpe.com/servers/ahsv. Keep your servers up to date with the HPE Smart Update solution by using Smart Update Manager (SUM) to optimize the firmware and driver updates of the Service Pack for ProLiant (SPP). Learn more at http://www.hpe.com/info/smartupdate. Designed for large enterprise and service provider environments with hundreds of HPE servers, the iLO Amplifier Pack is a free, downloadable open virtual application (OVA) that delivers the power to discover, inventory and update Gen8, Gen9 and Gen10 HPE servers at unmatched speed and scale. Use with an iLO Advanced License to unlock full capabilities. Learn more at http://www.hpe.com/servers/iLOamplifierpack. Enables the ability to access, deploy, and manage your server anytime from anywhere from select smartphones and mobile devices. For additional information please visit: http://www.hpe.com/info/ilo/mobileapp. RESTful Interface tool (iLOREST) is a single scripting tool to provision using iLO RESTful API to discover and deploy servers at scale. Learn more at http://www.hpe.com/info/resttool. Provision one to many servers using your own scripts to discover and deploy with Scripting Tool (STK) for Windows and Linux or Scripting Tools for Windows PowerShell. Learn more at http://www.hpe.com/servers/stk or http://www.hpe.com/servers/powershell. HPE OneView Standard can be used for inventory, health monitoring, alerting, and reporting without additional fees. It can monitor multiple HPE server generations. The user interface is similar to the HPE OneView Advanced version, but the software-defined functionality is not available. Learn more at http://www.hpe.com/info/oneview. Ideal for environments already using HPE SIM, it allows you to monitor the health of your HPE ProLiant Servers and HPE Integrity Servers. Also provides you with basic support for non-HPE servers. HPE SIM also integrates with Smart Update Manager to provide quick and seamless firmware updates. Learn more at http://www.hpe.com/info/hpesim. This product is covered by a global limited warranty and supported by HPE Services and a worldwide network of HPE Authorized Channel Partners resellers. Hardware diagnostic support and repair is available for three years from date of purchase. Support for software and initial setup is available for 90 days from date of purchase. Enhancements to warranty services are available through HPE Pointnext operational services or customized service agreements. Hard drives have either a one year or three year warranty; refer to the specific hard drive QuickSpecs for details. NOTE: Server Warranty includes 3-Year Parts, 3-Year Labor, 3-Year Onsite support with next business day response. Warranty repairs may be accomplished through the use of Customer Self Repair (CSR) parts. These parts fall into two categories: 1) Mandatory CSR parts are designed for easy replacement. A travel and labor charge will result when customers decline to replace a Mandatory CSR part; 2) Optional CSR parts are also designed for easy replacement but may involve added complexity. Customers may choose to have Hewlett Packard Enterprise replace Optional CSR parts at no charge. Additional information regarding worldwide limited warranty and technical support is available at: http://h17007.www1.hpe.com/us/en/enterprise/servers/warranty/. HPE iLO Advanced licenses offer smart remote functionality without compromise, for all HPE ProLiant servers. The license includes the full integrated remote console, virtual keyboard, video, and mouse (KVM), multi-user collaboration, console record and replay, and GUI-based and scripted virtual media and virtual folders. You can also activate the enhanced security and power management functionality. Learn more about HPE iLO Advanced athttp://www.hpe.com/servers/iloadvanced. HPE iLO Advanced Premium Security Edition for iLO 5 includes iLO Advanced License plus high-end security modes, unique security capabilities, like Automatic FW recovery; Runtime FW verification, and Secure erase. Learn more about HPE iLO Advanced Premium Security Edition at: http://www.hpe.com/servers/ilopremium. HPE OneView brings a new level of automation to infrastructure management by taking a template driven approach to provisioning, updating, and integrating compute, storage, and networking infrastructure. It provides full-featured licenses which can be purchased for managing Gen8, Gen9 and Gen10 servers. To learn more visit http://www.hpe.com/info/oneview. HPE Insight Cluster Management Utility is a HyperScale management framework that includes software for the centralized provisioning, management and monitoring of nodes and infrastructure. Learn more at http://www.hpe.com/info/cmu. Hewlett Packard Enterprise supports various accelerators on select HPE Proliant servers to support different workloads. The accelerators enable seamless integration of GPU computing with HPE ProLiant servers for high-performance computing, large data center graphics, deep learning and virtual desktop deployments. These accelerators deliver all of the standard benefits of GPU computing while enabling maximum reliability and tight integration with system monitoring and management tools such as HPE Insight Cluster Management Utility. The story may end with servers, but it starts with the foundation that makes compute go – and business grow. We’ve reinvented our entire portfolio of rack and power products to make IT infrastructure more secure, more practical, and more efficient. In other words, we’ve created a stronger, smarter, and simpler infrastructure to help you get the most out of your IT equipment. As an industry leader, Hewlett Packard Enterprise is uniquely positioned to address the key concerns of power, cooling, cable management and system access. HPE G2 Advanced and Enterprise Racks are perfect for the server room or today’s modern data center with enhanced airflow and thermal management, flexible cable management, and a 10 year Warranty to support higher density computing. HPE G2 PDUs offer reliable power in flexible form factors that operate at temperatures up to 60°, include color-coded outlets and load segments and a low-profile design for optimal access to the rack and support for dense rack environments. HPE Uninterruptible Power Systems are cost-effective power protection for any type workload. Some UPSs include options for remote management and extended runtime modules so you’re critical dense data center is covered in power outages. HPE KVM Solutions include a console and switches designed to work with your server and IT equipment reliably. We’ve got a cost-effective KVM switch for your first rack and multiple connection IP switches with remote management and security capabilities to keep your data center rack up and running. Learn more about HPE Racks, KVM, PDUs and UPSs at HPE Rack and Power Infrastructure. SCE is a guided self-service tool to help sales and non-technical people provide customers with initial configurations in 3 to 5 minutes. You may then send the configuration on for configuration help, or use in your existing ordering processes. If you require "custom" rack configuration or configuration for products not available in SCE, please contact Hewlett Packard Enterprise Customer Business Center or an Authorized Partner for assistance. HPE Pointnext provides a comprehensive portfolio including Advisory and Transformational, Professional, and Operational Services to help accelerate your digital transformation. From the onset of your transformation journey, Advisory and Transformational Services focus on designing the transformation and creating a solution roadmap. Professional Services specializes in creative configurations with flawless and on-time implementation, and on-budget execution. Finally, operational services provides innovative new approaches like Flexible Capacity and Datacenter Care, to keep your business at peak performance. HPE is ready to bring together all the pieces of the puzzle for you, with an eye on the future, and make the complex simple. Unlock all of the benefits of your technology investment by connecting your products to Hewlett Packard Enterprise. Reduce down time and improve diagnostic accuracy with a single consolidated view of your environment. By connecting, you will receive 24x7monitoring, pre-failure alerts, automatic call logging, and automatic parts dispatch. HPE Proactive Care Service and HPE Datacenter Care Service customers will also benefit from proactive activities to help prevent issues and increase optimization. All of these benefits are already available to you with your server storage and networking products, securely connected to HPE support. Learn more about getting connected at http://www.hpe.com/services/getconnected. Provides for the basic hardware installation of HPE branded servers, storage devices and networking options to assist you in bringing your new hardware into operation in a timely and professional manner. HPE will provide HPE-supported replacement parts and materials necessary to maintain the covered hardware product in operating condition, including parts and materials for available and recommended engineering improvements. Parts and components that have reached their maximum supported lifetime and/or the maximum usage limitations as set forth in the manufacturer's operating manual, product quick-specs, or the technical product data sheet will not be provided, repaired, or replaced as part of these services. The defective media retention service feature option applies only to Disk or eligible SSD/Flash Drives replaced by HPE due to malfunction. The HPE Support Center is a personalized online support portal with access to information, tools and experts to support HPE business products. Submit support cases online, chat with HPE experts, access support resources or collaborate with peers. Learn more http://www.hpe.com/support/hpesc. HPE's Support Center Mobile App* allows you to resolve issues yourself or quickly connect to an agent for live support. Now, you can get access to personalized IT support anywhere, anytime. HPE Insight Remote Support and HPE Support Center are available at no additional cost with a HPE warranty, HPE Support Service or HPE contractual support agreement. *HPE Support Center Mobile App is subject to local availability. 1. Pre-configured models ship with the configurations below. Options can be selected from the Core or Additional options section of this QuickSpecs. 2. Hewlett Packard Enterprise does not allow factory integration of options into pre-configured models. Any additional options purchased will be shipped separately. 3. If you desire a custom configuration please see "Configuration Information - Factory Integrated Models" section of this QuickSpecs. NOTE: Runs at 2133 MT/s due to processor limitation. NOTE: Runs at 2400 MT/s due to processor limitation. 3-year parts, 3-year labor, 3-year onsite support with next business day response. NOTE: UEFI is the standard default for all Pre-configured models. NOTE: UEFI is the standard default for all Smart Buy models. NOTE: Runs at 2666 MT/s. This section lists some of the steps required to configure a Factory Integrated Model. To ensure valid configurations are ordered, Hewlett Packard Enterprise recommends the use of an HPE approved configurator. Contact your local sales representative for information on configurable product offerings and requirements. 1. Factory Integrated Models must start with a CTO Server. 2. FIO indicates that this option is only available as a factory installable option. 3. All Factory Integrated Models will be populated with sufficient hard drive blanks based on number of drives ordered with server. NOTE: HPE offers multiple Trade Agreement Act (TAA) compliant configurations to meet the needs of US Federal Government customers. These products are either manufactured or substantially transformed in a designated country. Please select one –L21 processor required below. For second processor, please select the same processor model with –B21 from Core Options – HPE Processors section. For example: first processor, select 876099-L21 then for second processor, select 876099-B21. NOTE: For first processor, -L21 will include 5 fans, For second processor, -B21 will add 2 additional fans (for 4 LFF and 8 SFF CTO Server). 10 NVMe CTO Server will always get 7 High Performane fans regardless of 1 or 2 processors. NOTE: Maximum memory capacity per processor is dependent on processor models. All processors support up to 768 GB max memory per processor except “M” model processors will support up to 1.5 TB max memory per processor. NOTE: Mixing of 2 different processor models are NOT allowed. NOTE: DDR4 speed is the maximum memory speed of the processor. Actual memory speed may depend on the quantity and type of DIMMs installed. NOTE: Processors with 130W or higher will ship with the High Performance heat sink plus SKUs 8156, 6128, 5122 as noted below. All other will processors will ship with the Standard heat sink. NOTE: Ships with High Performance Heatsink. Please select one or more memory from below. For memory Reliability, Accessibility, Serviceability (RAS) features whitepaper like Gen10 Fast Fault Tolerance and legacy mirrored memory feature etc. please go to: http://www.hpe.com/docs/memory-ras-feature. NOTE: Maximum memory capacity per processor is dependent on processor model selection or limitation. NOTE: Maximum memory speed is dependent on processor model selection or limitation. NOTE: A maximum of 12 NVDIMMs can be supported. Please select one or two power supplies from below. NOTE: Mixing of 2 different power supplies are NOT allowed. NOTE: TPM 2.0 is set as default, for 1.2 TPM setting instead, please select this option. NOTE: UEFI is the default, this FIO part can be used for CTO to enable Legacy mode. NOTE: Some options may not be integrated at the factory. To ensure only valid configurations are ordered, Hewlett Packard Enterprise recommends the use of an Hewlett Packard Enterprise approved configurator. Contact your local sales representative for additional information. NOTE: This kit is not available on the 10 NVMe model. NOTE: This kit is required for Optical Drive option (8SFF model only). NOTE: This kit is only supported on USB 3.0 ports only. NOTE: This kit is required for Optical Drive option (4LFF model only). NOTE: This kit is supported on the 8SFF model only. NOTE: For second processor, -B21 will add 2 additional fans (for 4 LFF and 8 SFF chassis). 10 NVMe chassis will always get 7 High Performane fans regardless of 1 or 2 processors. NOTE: Ships with Performance Heatsink. 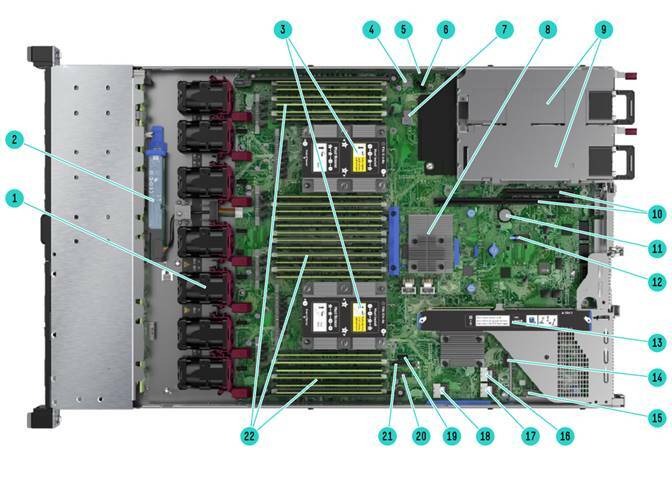 To streamline the configuration process for HPE ProLiant Gen10 servers and to provide the best product availability, HPE recommends SSDs from the list located here: http://www.hpe.com/products/recommend. NOTE: The Universal SATA M.2 Kit above will require a PCIe slot and support up to two of the same M.2 cards below. NOTE: The DL360 SATA M.2 Riser Kit above is part of the Primary Riser so it will not take up a PCIe slot and will support up to two of the same M.2 cards below. NOTE: For additional InfiniBand information: https://www.hpe.com/h20195/v2/GetHTML.aspx?docname=c04154440.